« If there were no clouds, we should not enjoy the sun ». No surprise for those who know the country, this is an Irish saying. Indeed, Irish clouds have a certain way of playing with the sun, a thousand different lights pour down on the land which is at once arid and generous. All lights are born in Ireland. The stark moors open themselves up to you, like lunar landscapes, harsh and bare. They belong to another time when Man was alone, alone with his struggles. Face to face with Nature, with God. 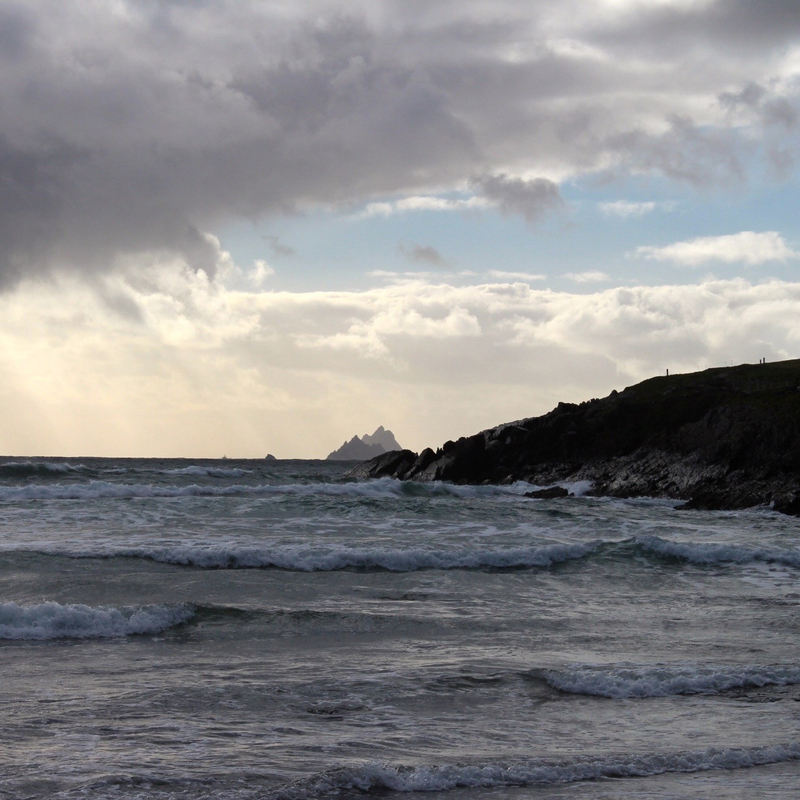 I often think about Skellig Michael. During the VIIth century, a small group of ascetic monks left the mainland for the absolutely remote sea crag and built a monastery on it. Nowadays, the monks have left, only remain the 500 steps, each one manually carved into the rock, and the beehive buildings which made up the monastery. The access is highly restricted, the climb is dangerous and long but once you arrive at the top the immensity of the sea, land and heaven hits you. You feel the energy in everything around you and understand why the monks thought that this was where they would be closest to God. A breathtaking place. The spiritual, legendary, mystical Emerald Isle is full of mysterious creatures. It lets you believe you have figured it all out and yet most of its secrets remain veiled, our occidental rationality forbidding true connection to the land and its powers. The same moors appear generous and thriving under a different light. Colourful, sometimes exotic-looking, wild flowers bloom everywhere, from the fields to the cracks of dry stone walls. To generous land, generous beings. Irish generosity is proverbial and far from being overrated. A difficult land sometimes, you have to earn it, fight for it, once you fight for though, it recognizes your right to life. In fact, in Ireland, you’re not always in front of a landscape when you stare out into the emptiness, the wilderness and contemplate the horizon. Most times, you’re just staring at yourself. Éire go deo, Ireland forever.